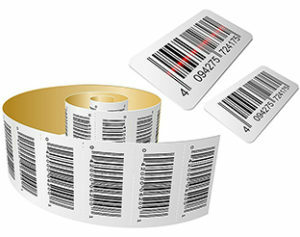 RVB Systems Group offers hundreds of different sized stock labels for barcode printing and identification applications. We provide both THERMAL TRANSFER LABELS and DIRECT THERMAL LABELS. Thermal transfer labels require you to use a printer ribbon. These type of labels are available in several different materials, including paper, polyester, and other synthetic materials. When matched with the correct type of printer ribbon, thermal transfer technology produces long lasting, clear, crisp images which are capable of withstanding extreme conditions. Direct thermal labels do not require a printer ribbon. These type of labels are only available in paper material. Direct thermal labels generally do not last as long as thermal transfer labels. While the direct thermal labels themselves maybe more expensive than thermal transfer labels, the overall cost of printing is generally lower due not needing printer ribbon. The following links show pricing for stock labels from RVB Systems Group. We also sell CUSTOM SIZE labels for ANY APPLICATION. Contact us today if you need pricing on custom labels. We have happy to help.